Healthy eating, at its core, is pretty simple. We’re supposed to eat a wide variety of plants — fruits and vegetables — lean proteins, and complex carbs. Most of us know this already. If we’re hungry and start digging around our kitchens for a snack, we know that we’re supposed to choose the apple, not the potato chips. Of course, lack of food and nutrition knowledge can make healthy choices difficult, as can lack of access to healthy food — especially in food deserts, where fresh produce isn’t readily available. But if the knowledge is there (i.e. we know apples are better than potato chips), and we have the option to eat something healthy — the apple is right there in front of us — why do we still sometimes choose to eat junk? Britney Kennedy, the founder of Philadelphia’s OnPoint Nutrition, says that around 60 to 70 percent of the people she works with have good idea of what’s healthy. And while it’s her team of nutritionists’ jobs to help educate people about healthy eating, they also work to help people understand why they’re not making good choices with their food. Below, some of the biggest reasons Kennedy has seen for why we opt for junk food — even when there are other, better options. Let’s be honest: Modern life is stressful, and now that many of us carry around mini computers in our pockets, it can feel like the barrage of demands on our time and energy is never-ending. Kennedy gives the example of one client who would come home from a long day of work, walk into her house, and immediately start eating whatever was on hand. She used food to decompress from the day, leading to thoughtless consumption of snacks. To change this habit, Kennedy recommends finding some other outlet to actively manage your stress — something that keeps your brain busy so you’re not eating brownies to distract yourself. As for what that stress-management tool is, Kennedy says it’ll differ for every person. Maybe for you it’s distracting yourself with Youtube videos of cats, knitting, or going for a walk — whatever it takes to decompress. For the client Kennedy coached, it was using a meditation app while still sitting in her car in her driveway for a few minutes before heading into the house. How many times have you finished a long day at work, seen the fresh chicken and veggies in the fridge, ready to be cooked, and thought, This will take too long. I’ll just order takeout — only then to spend the next hour exploring Grubhub, deciding what you want, and waiting on your delivery? Kennedy says that this perceived lack of time — the thought that making a healthy meal will take too long — can make it harder to eat well. We’re all busy, sure, but sometimes the unhealthy option actually takes longer. Things like spending a weekend afternoon meal prepping, or even just spending 15 minutes every week mapping out your dinners, can make a huge difference. 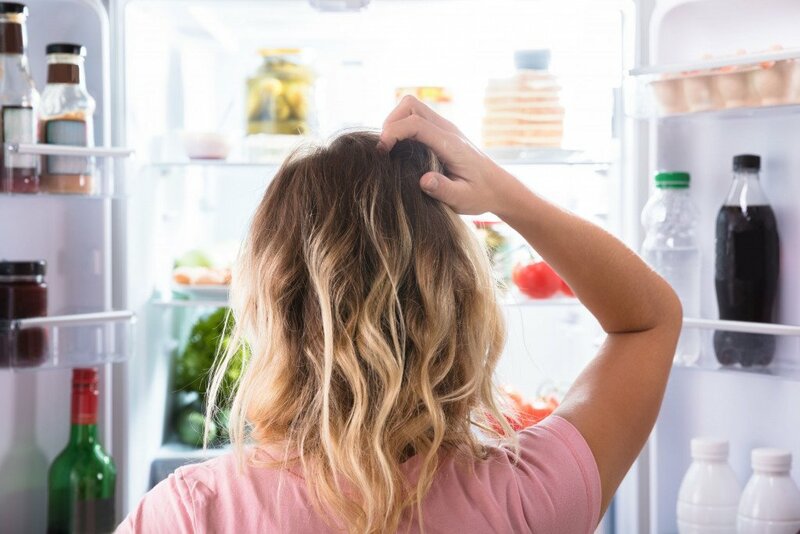 It can be easy to get wrapped up in all our other responsibilities, but Kennedy says if you’re organized with your time, prioritizing healthy eating doesn’t have to fall by the wayside. I think we can all agree that pizza tastes delicious. So if we’re going to choose to not eat pizza every night, we need a good reason. Of course, the answer is no. That’s why there’s a need for a better goal — and a better plan to get to it. Your goal is going to be what’ll keep you on track when you’re stressed and tired and don’t feel like cooking. If your goal is to stay alive longer, that’s a pretty good motivation to dial up delivery a little less.